Wakefield have "nothing to lose" in their play-off eliminator against Leeds Rhinos on Saturday, according to captain Danny Kirmond. The Wildcats travel to last year's Grand Final winners on Saturday on the back of seven consecutive victories. "It was our goal to make the play-offs and now we're here we've got nothing to lose," he told BBC Radio Leeds. "We have to put everything we have in this one game because if you're not on form it could be your last." The 26-year-old added: "We've hit some really good form and we're even winning games when we're not playing well. "We've always been confident in the camp of what we were doing and at our own ability. "It's always going to be tough playing Leeds but we've beaten them once this year and we've played well every time we've gone there." 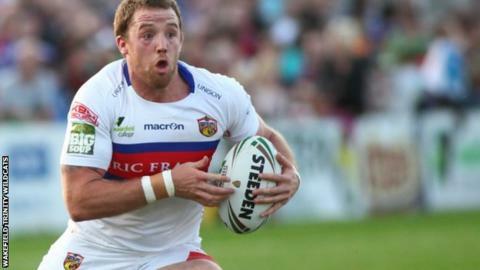 Wakefield moved up into the top eight for the first time this season with just one round of matches remaining but their victory over Salford coupled with Bradford's defeat at Catalans saw them seal a play-off berth. Kirmond, who joined the Wildcats from Huddersfield in the close season, is now dreaming of reaching the Grand Final. "It would be awesome for Wakefield to bring their travelling army to Old Trafford," he continued. "I've been here to watch football a few times and the atmosphere on a Champions League night and the Grand Final is really special. "It's a goal for all players to play in one, it would be amazing."